Over the past few weeks on Galway's Flute Chat group, we've been discussing the whole topic of hand and arm comfort. James Galway was suffering right hand problems; I've long had a problem with the left arm (witness my wooden key extensions on my videos) and the topic of The Thumbport came up and was much discussed. To clarify several of the points made, I created a quick video in answer to a question of what happens when the flute is unstable in the hands. Here's the headjoint alignment video. There are also some photos in in a short photo essay in pdf of the flute keys tilting backwards, and how to spot it, for flute teachers. Read below some of the other interesting emails and responses. thumb--called "trigger finger." It's when the tender sheath collapses around the tendon and the joint hurts and makes a clicking noise when you bend it. I can assume, but can't say for certain, that I was putting too much pressure on the thumb, as I needed to slide it back and forth from b to b-flat. Hand surgery took care of it. Also, I like the idea that not everyone needs to change their flute setup. But it never hurts to make adjustments to see how they work. It is my right arm which nags me the most. What are your thoughts on that? If the forearm is currently painful to the touch, you might want massage only on adjacent areas to start with. Twice weekly may help. Eventually the massage person can focus on the bicep, shoulder, fore-arm and hand, once it has begun to be pain-free, and loosen any longterm muscle tightness that is present. 2. Heated clay wraps - you can find heat-able clay wraps for the forearm if you ask around at the alternative/herb health shops for the best clay powder to use. Clay wraps are used for athletes who have strained or pulled muscles. The dehydrated clay powder is heated by mixing with boiling water, applied to the forearm, and wrapped with a cloth and a then a protective plastic cover (to save your carpet and furniture if you're messy with this stuff.) Alternately you can simply use the clay and an old towel while soaking in a bath. The clay is left on for 20-60 minutes to pull built-up toxins in the arms through the skin. You can wear a deep-heating clay wrap on the forearm while resting or watching a movie etc. See: http://www.eytonsearth.org/carpal.html or http://www.earthtobody.ca/products/clayneem.cfm for information about which types of clay and how to wrap. Doing this at home for $14 and the use of some old towels is far cheaper than getting the $200 spa treatment of same. 3. Yoga/Stretching - If you start an easy yoga course. Richard Hittleman's 28 day Yoga plan is a good little paper back book for beginners. you may find that the stress levels go down considerably in a few days from the yoga breathing and stretches. Protect the injured arm at first, and don't try to stretch it too much or too rigorously, but use the gentle easy yoga and slow stretching to relax the rest of the body. The arm will benefit from increased blood flow which will help remove the built up chemicals in the tissues. 4. Flute Thumbport - For $20 you can test out a right thumb flute "Thumbport". I recommend them highly. They reduce the need to clasp the flute with the right hand, and the fingers, hand and forearm can remain completely relaxed while playing very very VERY fast technique. I find the technical speed and lightness of play using this device to be extra-ordinary. It easily slides on or off for your choice of when to use it. If you have ever cocked the right wrist at an angle, instead of using a straight wrist, this thumbport device allows you to completely straighten the wrist so that the tendons in the forearm can expand and contract freely, without becoming shortened in the wrist area. The straightening of the right wrist and the ease of using the thumbport will facilitate the sliding of the forearm tendons to reduce muscular tension in the right arm. 6. 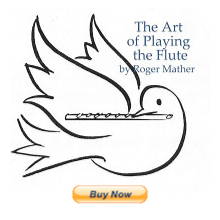 Body Mapping for Flutists, by Lea Pearson and any good book on Alexander Technique would both have a great deal to offer in terms of long-term flute posture awareness. I particularly recommend a book called: "Indirect Procedures" for musicians with muscle strain. A particular kind of Taoist Tai-chi is highly recommended for musicians with body tensions. It's the same remarkable slow-motion "dance" style of martial art that you see practised in China, but with more attention to not damaging the knees of the student. Tai Chi guides healing and quickly soothes nerves and muscles, allowing nerve pathways to regenerate after years of tightness or strain, through the gentle re-alignment of the nerve and blood pathways or ley-lines in the body. I highly recommend this for anyone who stands still to practise for several hours a day. I hope that one or more of these suggestions is helpful. There are countless more suggestions at the link below. There's a good flutist's diagram from "Body Mapping for Flutists" by Lea Pearson that really helped me figure out the pains I had in my left arm. It shows how the blood and nerve supply to the arm can become pinched by tight muscles in the shoulder area. Those tight muscles can pinch the blood and nerve flow to the arm up in area where the collar bone and top ribs meet. Here's a close up medical text book picture. After years of repeated left arm/hand injury I finally discovered that the real reason for the pain in my left arm was this shoulder/thoracic pinching. I had been choking off the blood supply to the left arm quite high up, in the "thoracic" area by consistently tightening my shoulder muscle groups over long hours of practise. This pinching of the thoracic area happens slowly, over time, and the muscles very gradually get less and less blood. With no blood to clear away chemicals and built up crystals in the muscles, the result is pain in the muscles. They need to be flushed out and can't because their blood supply is being squeezed off at the source. Unknowingly, by holding my shoulder every so slightly "UP and IN" plus tilting my head while practising I had been contracting several groups of muscles in the shoulder area (thoracic area) that hardened into place, and then gradually cut off the blood and nerve supply to the arm, resulting in forearm and hand pain. When the massage person worked deeply on the shoulder area, pulling apart the tight faschia-tension that had built up , the pain disappeared in 45 minutes!! When I play the flute and feel any pain in the arm, I re-picture this shoulder/thoracic anatomy, and try and gently release my upper arm to allow the arm bone to hang freely in its socket, without shoulder tightness or contraction. I also release any pinching of the muscles around the under-arm, shoulder and collar bone area. You can clearly see when the anatomical pictures emphasize the blood and nerve supply to the arm following a tiny, narrow space between the upper ribs and collar bones, just how the pinching from too tight muscles could pinch shut the blood flow to the arm. To free up the blood flow and nerve pathways to the fore-arm or hand, the muscles around the shoulder area have to be loosened considerably by massage and heat. I would ask your massage person to work on the thoracic area and to release any habitual contraction. Here's a picture and a very thorough article about Thoracic problems. A very good massage therapist should be able to feel the contraction, and release it gently for you. Rolfing and/or myo-fascial release practicioners are also very skilled at this. Great that you put this all in one place! Thanks! Haven't been able to locate the clay-wraps. You may have to tell ME if you find them. c) don't practise in a way that hurts your arms and hands. Play technique and tone alternating, and like Julius Baker teaches; go slowly; do not race or play repeditively at high speeds. Racing plus repetition of fast technique inevitably hurts muscles. Don't do it. I know from experience. See: http://www.jennifercluff.com/deathgrip.htm to read what happened to me; and now I have permanent nerve damage in the left arm. PLEASE protect yourself from this level of damage. Jen, I just recently discovered your wonderful website and already I am seeing a huge difference in my playing experience. This website is so rich in material that it will take me a long time to get through it all. In the meantime, I feel like I am getting incredible professional help with my flute playing. My greatest weakness is sight reading, and I see that you have even addressed that issue! So glad you commented with such positive results. 1) Made me realize that it's best to set up the flute in a way that produces the best tone & the least bodily stress FOR ME, and that my set-up may not be the same as someone else's. Under the direction of Alexis Del Palazzo, I've become familiar with the "Body Mapping for Flutists" book, and your video dovetailed nicely! 2) My husband (in his 40's) is just starting out with the flute, and for basic stuff, at the moment, I'm his teacher. I have been CONSTANTLY telling him to roll out, as the way he sets up his flute (when centered) has his keys pointing at the ceiling! I can't wait to show him this video, as it explains much more succinctly & eloquently what I've been trying to get across. I had been suffering from chronic left shoulder pain and upper arm pain, which was aggrevated during flute playing. It turned out I had calcific tendonitis as a result of continued straining or injury which preventing proper healing. I have been healing with the aid of physical therapy, but I also researched information regarding the posture during flute playing, since I always feel very uncomfortable when playing the flute. I found some information in your site. I realized that I was pulling my left shoulder too forcibly towards my body, which probably is the main reason for the strain. Then also realised that I had difficulty holding the flute stable. I have just completed 2 years in flute playing and I know it is not much, but I was feeling stuck at a point in tone development, beyond which I couldn't move forward. I tried your recommendation on the alignment of the headjoint with the far end of the hole. Suddenly everything got much easier, holding the flute, the finger movements and even making a clean unblocked sound was easier. I practiced with this alignment for 2 months suring summer. My private lessons begun again this week. My teacher told me that this alignment is not apropriate and it may create tone problems in the future. But still we will try it for a while because its more comfortable for me. The thing I want to ask is, my flute is not inline, that is, the flute key which is the closest to the hole is not aligned the same to the other keys. Then which key should be my reference? I have aligned according to the center of the second key, maybe that has turned the headjoint too much inward. The second thing is, is this alternative alignment well known in Europe? I have been hearing that European style and US style can be different. I've done a lot of research on aligning the headjoint for comfort. The position is slightly different for every player (finger length, chin shape, lip shape are variables.) but it definitely does not cause tone problems in the future. Many of my students, and myself, have no problem playing like this for years with excellent tone development. Once you find the comfortable alignment, mark it with a sticker on barrel and head-joint, or with a shiny-surfaces marker; make a tick mark. I line up the far side of the blow hole with the center of the keys. This alignment is also recommended by Quantz (1752), Devienne (1795), Berbiguier (1820), Drouet (1827), Dressler ((1828), Tulous (1835) and all sorts of fundamental flutists from the past and present. Let your teacher know. They are all listed in the new reprint of Drouet's Method in the XIII page of the introduction. So yes, align your headjoint to suit your own ergonomics. Experiment, and then mark it. You can always move the marks. See: www.jennifercluff.com/lineup.htm for more info. I'll experiment to find the best position. Oh my goodness, this helped me so much. About the 7th time I've picked up the flute and I've been getting discouraged with the way it was rolling; this made all the difference and I played for a very long time without the pain I'd had!